For a twist on the traditional mashed or scalloped potatoes side dish, try this (somewhat) easy to make combination of two kinds of potatoes. Your standard white Russets are paired with sweet potatoes and pungent leeks, which provide a nice onion-y flavor, and woodsy and aromatic thyme is the only herb used. Parmesan cheese adds a nice nuttiness and saltiness...and you can taste rich butter in every bite. The potatoes must be sliced thinly, which can be slightly time consuming (mandoline for Christmas please! ), and each variety is then tossed with the buttery thyme mixture. The potatoes must then be layered in an ovenproof skillet with the leeks and Parmesan, almost like making a potato lasagna. Make sure your skillet is ovenproof! I used what I THOUGHT was a nonstick cast iron skillet, and my attempts at flipping the baked potatoes upside down into a pie plate were unsuccessful (hence the photo...this was supposed to be a wedge shape). The top also burned slightly...so again, use nonstick. The flavor was not damaged in any way however, and leftovers seemed to get better after being refrigerated overnight. At least you can cut an actual wedge shape then. Make again? Definitely. 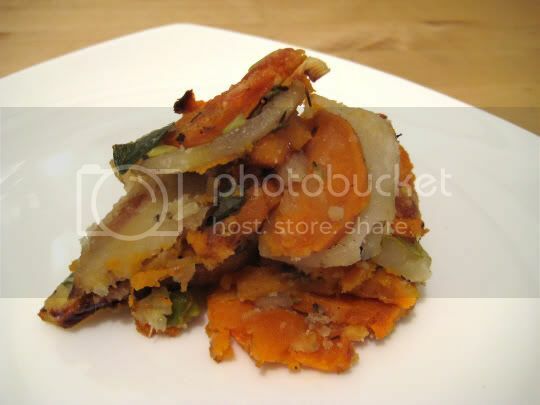 This is a great alternative for potato side dishes for the holiday (or anytime) table.